On this most auspicious tithi of Guru-purnima, the appearance day of Srila Krishna-dvaipayan Vedavyasa Muni and disappearance day of Srila Sanatan Goswami, Srila Gurumaharaj narrates the life of both the exalted personalities in brief. Specifically, he emphasizes on the main teachings one need to accept from their life. Vedavyas Muni is shaktyavesh avatar of Lord, non-different from the Lord Himself. He was a very learned person who wrote so many scriptures. In spite of writing so many scriptures, he did not get inner peace in his heart. On the order of his Gurudev, Srila Narad Goswami, when he glorified the Supreme Lord, he experienced the highest bliss in his heart. Today is Guru-purnima and along with it disappearance day of Srila Sanatana Goswami. Last week, we saw Slovenian devotees in the conference. That day, I had to speak in Hindi to satisfy the devotees, our secretary Pujyapad Tridandi Swami Bhakti Vigyan Bharati Maharaj spoke in Bengali. The people from Bengal cannot understand Hindi. That is the difficulty. So I announced that day that I will remember the glories again, for the foreign devotees. Although, our Param Gurudeva, as I have heard from our Gurudeva, when he was speaking in Madras Gaudiya Math, he spoke in Bengali. At that time Bengali listeners were there. Afterwards some dignitaries came from the city. Their mother tongue was Tamil. They could not understand Bengali. They could understand English only. Literate persons were there. So our Brahmacharis and Sanyasis approached Srila Prabhupad and requested him to speak in English because there are some local devotees, they will not be able to understand if you go on speaking Bengali. But our Param Gurudeva still was speaking in Bengali. They approached him repeatedly and requested but then too he did not speak in English, he spoke in Bengali only. Afterwards when they were too much eager, then Srila Prabhupad told them, “I have not heard from my Gurudeva that bhakti can be propagated and transmitted by language, I have not heard. It can be transmitted by any language, if the listener is sincere. Because those words are transcendental words, coming from the transcendental realm. Those words will touch your soul. Soul is also transcendental, whether you understand or not, the vibration itself will create something in your mind and your eternal nature will be manifested, causeless devotion. But if you hear in your own language, very fluently, very nicely, but his (speakers) ego is here in his honor and (if he has) mundane interests for what he is speaking, (if the) ultimate end is something else, not known, then you will not be benefitted, spiritually. You may understand it; but there will be no actual benefit. So I never heard from our Gurudeva that through language devotion can be transmitted to any other person.” I heard it from our Guru Maharaj, our Param Gurudeva used to and can speak English very well. He is a learned person. Intentionally he did not speak (in English). Only to teach the Bramhacharis that if you have the desire to deliver speech and deliver a good speech and (earn) good name in this world, your spiritual life will be lost and the end will be something. It should be for the satisfaction of Krishna. You have to pray for Their grace. Day before yesterday was Guru-purnima. What is the meaning of Guru-purnima? Full moon day of the month of Ashadh. Ashadh is Bengali calendar month. Vedvyasa muni appeared on that day. So the whole India, even outside India those who have belief in Sanatana Dharma they perform worship of Vedvyasa Muni everywhere. Vedvyasa Muni appeared in an island, island means dvip. His complexion was black, he is known as Krishna Dvaipayana. Krishna means black complexion and Dvaipayana means born in dvip, Krishna dvip. He was Krishna Dvaipayana, Vedvyasa. Vedvyasa means one who has expanded the Vedas or divided the Vedas into four categories. An ordinary person cannot do this. There is some power, spiritual power behind him. (He is) Saktyavesh Avatar. That power is given by the Lord to Him. He appeared accepting Parashara Rishi, very powerful Rishi and Satyavati, as Krishna Dvaipayana Vedvyasa Muni. He dedicated himself for all the spiritual matters and he said to his mother I shall not be with you, but whenever you will remember me I shall come to you. You are not to inform me by letter or through anybody. If you remember me under any difficult circumstance, I shall understand it and I shall be able to come to you. On that condition, he remained there and wrote all these, divided Vedas and he wrote 18 puranas. Also he wrote Vedanta the most adored scripture of the Jnanis, philosophical aspects you will get. He wrote Mahabharata and Gita, Gita is there within Mahabharata. So he is respected by all in India whatever group it may be, karmi, jnani, yogi, bhakta, everyone. Everyone gives respect to Him. It is called Guru-purnima. He is worshipped everywhere. He has got so much power. Something should be spoken about him. He is not an ordinary man. By accepting him as father, Dhritrastra, Pandu and Vidur appeared, but Dhritrastra was born blind. During Kurukshetra war he was there in his house and out of affection, Vedvyasa muni imparted power to Sanjay to see everything in the battlefield, what are the things happening there and he used to speak about it to Dhritarastra. Ordinary saint cannot do this. By imparted power of Vedvyasa Muni Sanjay saw everything in the battle field and he spoke about Gita to Dhritarastra. At the end of the battle, so many millions were killed. So their women’s had separation grief extreme. Then Vedvyasa Muni told them not be disheartened. I will show (you all) your husband and other relatives. See they are alright. They saw their dead husband and dead relatives. Can any person do this? (Guruji explains) You want to merge yourself with the impersonal formless Brahma. You are committing suicide; to merge yourself into Paramatma, is further worse than Brahmananda, Brahma sayujya. Nobody can get actual Brahma sayujya without the grace of Supreme Lord. Supreme Lord is all powerful, He is the giver. When Chatuhshan performed penance and wanted Brahmananda, but accepting Supreme Lord as the Supreme, worshipping the Supreme Lord, they prayed for salvation then they got. If without accepting Him you do, you will get zero, nothing. You can get nothing. Here in this world as long as human beings are there with their senses, thinking, feeling and willing, (that is till the time the soul which is anu sachidanand is there) so long you will go and you will get help or advice and everything. When that is removed (that leaves) from the body then what you can give, can you give anything? Can dead body give anything? What will you give? Give one instance where dead body has given (anything). And Supreme Lord is the cause of all infinite particles, substance of atomic parts of jivas, living beings. It is atomic part, as long as that anu saccidananda, atomic part of chidananda exists in the body, so long it will give you and can give satisfaction to others, others can give satisfaction to him. When that leaves your body nobody will touch your body and if they touch they will have to take bath. Yata vaivani jbhutani jayante …ena jatani jivanti.………………………………………………… Brahma. All the jivas are coming from Brahma, not from abrahma. Nothing can be because of something. These living beings, from where have they come? From inert matter without consciousness? If there is no consciousness (in the source) how consciousness can come? If you rub two woods, fire comes out, emerges. Oh there is no fire, after rubbing fire comes. No. Fire is there. Panchamahabhuta, earth, water, fire, air, sky all are there. By rubbing it appears. Something is coming from nothing, this is not the instance. Wrong instance. From Supreme Lord we have come. We are in Supreme Lord, we are by Supreme Lord. (Guruji explains) By His grace if He wants, to anybody who takes actual shelter to Him, He will appear. He will not think about the status of human being, whether they are birds or beasts. The person who takes shelter to Him—daivi hi esa guna maya mama durataya, mamev ye parapandhyante mayam etam taranti te. We go through Gita, we do not accept Gita. (Then) What is the use of going through Gita. He has got no differentiation—samo ‘ham sarvesu-bhutesu na me dvesyo ‘sti na priyah ye bhajanti tu mam bhaktya mayi te tesu capy aham (Gita 9.29). I am equal to all. Even an animal takes shelter to me I shall rescue him from Maya. But if you go by challenging mood by taking this human birth where Supreme Lord has given you the discriminating power between good and bad, right and wrong, eternal and non-eternal (then you will be deprived). You can accept eternal truth. You can give up (the challenging mood) you should not do this then you will be deprived. Other living beings have got no such discriminating power. There is one group which are mayavadi, they say ‘soham, soham, soham’. (They believe,) “By soham we become Bhagavan. Bhagavan sometimes becomes Bhagavan. Sometime He is not Bhagavan.” This is not true. Bhagavan is always Bhagavan. (Mayavadi think), “Sometimes when rubbed by Maya He becomes jiva and after soham He becomes Bhagavan.” (This is) Irrational talk. Bhagavan is absolute, Absolute is absolute, always absolute. There cannot be any state of non-existence of Supreme Lord. With challenging mood if you go by your finite intellect, very negligible, finite mental capacity then your whole spiritual life will be destroyed. (The knowledge) It will come through Supreme Lord’s preceptorial channel. It is the only path. There is no other path. If you go with your vanity, with ego, you will remain here all the time in this world. You cannot go there. There is no equal to Him or more than him. He is Asamurdhva (there is no one equal or more than him). Without His grace nobody can cross over this births and deaths, threefold afflictions. You have committed offence at His Lotus feet. Jiva is part of His potency, Chaitanya Mahaprabhu said marginal potency or apara potency. Supreme Lord is the possessor of the potency. Anything produced by the potency that is also belongs to Supreme Lord. I have got no hold over my body, this body belongs to Supreme Lord, the astral body (subtle body) belongs to Supreme Lord, atma belongs to Supreme Lord from apara prakriti according to Gita. Chaitanya Mahaprabhu says tatastha shakti. Philosophical solution. You are a part of the potency, not the part of the substance, you have eternal relation. That you have to understand. All the vaishnava acharyas, they have warned us if you give up this (relation, meaning if you forget this relation) then your whole human life will be futile. Tad Vishnu paramam padam sada pashyanti surayaha diviva chakshuratatam. Daily you meditate on this. What is the meaning? The lotus feet of Vishnu are eternal, sada pashyanti means always observing. The realized souls, emancipated souls always observing the lotus feet of Vishnu, must remain always (eternally) and the observer must be always (eternal). Then always observation can be possible. In Rig Veda it is said, sada pashyanti surayaha diviva chakshuratatam. How to see Him? By challenging mood? Brahma, he is the creator of the living beings in this world, this universe. He could not recognize Krishna, where from you have come, that you will recognize Krishna and Krishna’s absolute counterpart, the devotees, Impossible. Some say that Brahma made this as pastime. Brahma, we remember him in our preceptorial channel. Yes, he is our Guru. We always remember. But why Vedavyasa Muni has not written in his book that Brahma had made this pastime. There is some underlying intention behind this. These conditioned souls they will misunderstand this. You should understand that Brahma the creator by his own power, endeavor he could not get any knowledge of Vrindavan dham, any knowledge of cowherd boys, any knowledge of Gopa-gopis, Krishna. When Krishna himself was present, Brahma could not understand. (Vedvyas Muni say,) “To show these to conditioned souls, I do not want to say he made the pastimes and make it less important. You conditioned souls you make that sort of mentality of challenging mood, where is God and what you are?” When our Param pujyapad Swami Maharaj was there in America one young boy came. He said, Swamiji, “I do not believe God.” Then Swami Maharaj said, “Who has given you the power to say that I do not believe God? How long you can speak like this? How long you will be there? You have got this vanity, when the life will be taken out from the body, can you speak? Your speaking power is given by Supreme Lord. As you do not want to worship Supreme Lord and you want to enjoy so He created this universe and all these 84 lakh species to fulfill your desire and that also He is fulfilling.” If you were just alone you can do nothing. How long you will have this vanity? Therefore challenging mood should be totally removed if there is any ting of challenging mood, you will be deprived from the devotional school of thought, actual spiritually. You will not get this. Supreme Lord is descending through preceptorial channel. Our Bhakti Siddhant Saraswati Goswami Thakur, will he speak lie? Bhaktivinoda Thakur, will he speak lie? What for they have come? They were sent by Chaitanya Mahaprabhu. Because these human beings have got no understanding, by their own capacity they cannot understand the writings of Chaitanya Mahaprabhu, Shad Goswamis, Srimad Bhagavatam. So many pseudo sects cropped up. Nobody understood Chaitanya Mahaprabhu. Chaitanya Mahaprabhu sent Bhakti Siddhant Saraswathi Goswami Thakur. Now we can speak like this. But when Bhakti Siddhant Saraswati Goswami Thakur was present, he performed so much penance here in Mayapur, so much powerful penance. Those persons who went to talk with him to refute his Suddha Bhakti, when they saw him they could not utter a word. When they saw him and heard him they could not say anything. He is not an ordinary person. He is sent by Supreme Lord. Therefore our Param Gurudeva, you will find in starting of his sermons, his speeches, he advises us to make obeisances to the preceptorial channel. If you do not believe in him then you will be deprived of your emancipation from this world. By taking shelter to them, go on worshipping, what will you get? You will get (the love of Him) and you will give it to others also. And without that if you want with challenging mood, with our finite intellect, finite mental capacity, if you go and know Him then God will become finite. He is not finite. He is infinite. Now, you see, Our Narada Goswami told him, “You have not spoken about Krishna”. (Vedvyas Muni,) “I spoke about Krishna”. “There your end (goal) is something else, mukti, emancipation not Krishna. You have to sing the glories of Krishna for Krishna’s sake then you will have attachment to Krishna. If Krishna is satisfied then you will be satisfied. You have written there with the purpose to get emancipation, salvation. But that will not give you peace. You have to sing the glories of Krishna for his satisfaction knowing Him, I am of Him, I am a part of His potency”. And by getting the grace of His Grace Incarnate form of Krishna, Narada Goswami, who imparted four verses, by that imparted power he saw that (actual reality). He saw everything and after seeing he wrote Srimad Bhagavatam twelve centos (skandas) by which Krishna was satisfied. Then he got bliss. That (place) is there, in Bhadrinarayana. Badrinarayana temple it is not built by Gaudiya math. After Badrinarayan, above one thousand feet, there is an ashram. Everybody goes there to make obeisances. It is not built by Gaudiya Math. I had been to that place once with Guru Maharaj. Guru Maharaj sat there and he read Bhagavatam and we six-seven persons were there, in that cave, a very big cave. After getting peace, he instructed Sukhdeva Goswami and Sukhdeva Goswami gave up Brahmananda and became Krishna Premi and got Krishna prem. In Sukartala, where all the Rishi-munis were present, even Agastya Muni who drank ocean, Parashurama one of Dashaavatar all were present. All stood up (when Sukhadev Goswami came) and heard (Srimad Bhagavatam from) him for seven days. (Before Sukhadev Goswami’s arrival) Parikshit Maharaj was puzzled because the munis and rishis (assembled there) were suggesting him quite different paths. Then he remembered Krishna and prayed, “I was related with Pandavas. Kindly give me mercy, kindly help me, kindly grace me. After some days I shall be killed by snake bite.” Then He (Krishna) sent Sukhdeva Goswami. After hearing for seven days, without taking food, without sleeping, can you think about this without taking water whole seven days? Sukhdeva Goswami is giving Krishna Himself through transcendental sound to Parikshit Maharaj and he is accepting. After seven days, transcendental sound, Supreme Lord appeared in his heart and all the worldly things from the heart got removed. Where is such a speaker, actual speaker? Where is such actual listener, so that one can get the actual good? Now you see, in this matter we have to think about Sanatan Goswami. Today is Sanatan Goswami’s disappearance day. Because time is short what can be done? Long subject. After writing Bhagavat, Vedvyasa muni got bliss. By his life he has taught us if you go through Bhagavat, a bonafide Bhagavat and if you are bonafide, you will not be deprived. Na hi kalyankrit kascid durgatim tat gachhati. It is said in the Gita…Krishna is telling, emphatically. If anybody is sincere, he will not be deceived. Krishna has said, he will not be deceived. Krishna will send His own man. He will come and contact with them (conditioned souls). That preceptorial channel is given by Saraswati Goswami Thakur, Bhaktivinod Thakur, we should have firm faith in it and believe Him. Give your life for it and see whether you get the actual peace or not. You can see that afterwards. If you give up, you will go to hell, (will come back) to this world again. When you become averse to Sri Krishna, nobody will come to help you. His external potency (mahamaya) will envelop you and then you will do something by which you will be enveloped in this world. Mahaprabhu gave teachings to Sanatan Goswami, you should think about this, Why? Those who are followers of Bhakti Siddhant Saraswati Goswami Thakur, to them he has given his Vaishnav ke, one hymn (kirtan), he has not mentioned any other verse from any scripture. You should hear Sanatana Goswami, what question did he ask to Chaitanya Mahaprabhu and what teaching were given to him. His life is full of teachings. We have to go through his life, it is written by Kavikarna pura, the son of Shivananda Sen. Sanatan Goswami is dearest to Rupa Manjari. Bhaktivinod thakur is a Rupanugavaray, those who are subservient to Rupa Goswami. Bhakti Vinoda thakur is the best amongst them. In spiritual sense, Rupa is shrestha. Sanatan Goswami in the worldly sense is the elder brother of him. But in the spiritual sense, Rupa Goswami is the highest, Rupa-manjari and Sanatan Goswami is under him. His name is Rati manjari or Lavanga manjari. And also Sanatan of Chatuhshan entered into him. That is also written. They (Chatuhshan) were well established in Brahmananda and after getting the scent (aroma) of the flowers and other things offered to the feet of Narayana, they gave up Brahmananda and started worshipping Narayana. Sanatana also entered into Sanatana Goswami there it is written. And Sanatan Goswami when he was there in Maldah, Maldah was the capital at that time and Hussain Shah was the Emperor, he was there in one village Ramakeli, I had been to that place, and Rupa Goswami and Anupam younger brother, father of Jiva goswami, after seeing Chaitanya Mahaprabhu they wanted to renounce the world, do not want to remain in this world. Then Chaitanya Mahaprabhu said No, not now. When I shall go to Vrindavan then you can renounce. After that when Chaitanya Mahaprabhu (was travelling to Vrindavan), first Rupa Goswami with Anupam left that place. He was also a big person there with Hussain Shah Emperor. Sanatan Goswami was Prime Minister and our Rupa Goswami was finance minister, was a big officer there. He left his position and renounced and after renouncing he met Chaitanya Mahaprabhu at Allahabad (Prayag) and he wrote to Sanatan Goswami to come immediately. He mentioned that Chaitanya Mahaprabhu is going Vrindavan. He is actually Guru, Rupa Goswami, Rupa Manjari and he is the dearest of him, so Sanatan Goswami has to carry out his order and what did he do? What is written in Chaitanya Charitamrita? If anybody gets the grace of Chaitanya Mahaprabhu, even a mean person gets His grace, can become the introducer of Bhakti shastra. He can initiate (write) Bhakti sastra. It is the first verse, Kaviraj Goswami has written in 20th Chapter of Chaitanya Charitamrita. Sanatan Goswami was jailed by Hussain Shah (the King) when he (the King) went to Orissa to conquer (that region), he wanted to take him along. Sanatan Goswami was Prime Minister and he did not want to go. He disagreed to go so he was prisoned. At that time he got a letter from Rupa Goswami, Yadupate ka gata… Mathura puri…. Where is Yadupate, Krishna, now? Where is His Mathura dham? Raghupateh ka gatottar, where is Ayodhya dham? And Ramachandra? Nothing is permanent in this world. Immediately come. Do not spoil a moment. When he had to carry out the orders of his Guru, (Rupa Goswami) of a senior for that reason, Sanatan Goswami what did he do? He spoke to the Jailor. Jailor was a muslim and he had given him the service. He spoke to him, “You are jindapir and you are a living saint.” He was not a living saint, but he said so. That person (Jailer) cannot think about this. To give bribe is not a good thing, as a sadhu one should not do this. But he is doing it. Then he got about seven thousand mohars and put them in his hand. There were ten thousand mohars kept by Rupa Goswami for him for his release arrangement. By seeing them he (the jailer) got some sort of greediness to get them. They do not understand Vrindavan, (so he said he will) go to Mecca. “So there is no reason (for you to get afraid).” Ultimately, he gave it. For going to fulfill the desire of his Gurudeva and Chaitanya Mahaprabhu, what he did, (could) you think! He did everything, it is not good to speak lie, but he did that. He was released, he went through the villages not through towns and cities, he is a well known person and after longtime he came to Katra parvat, one mountain. There one land owner was there. But in the day time landowner and in night time robber. He has got an astrologer. That astrologer told the robber landowner, “Sanatan Goswami has got one person with him, Ishan, he has valuable 8 mohars. They thought we should kill them and take those. But Sanatan Goswami was very intelligent, he is not an ordinary person. He has good hold over Sanskrit, good hold over arsi, parsi, hindi and is very able man in Government. He was born in a Brahmin family, Bharadwaj family but he has got no such vanity and for that reason that when Rupa goswami and he were there with the King, he (Hussain Shah) tried to persuade him to remain there and continue as a Prime Minister. (Sanatan Goswami replied,) “No, I shall not go to assembly whatever punishment you want to give you give.” Then he imprisoned him. The King has got love for him. He knows that Sanatan Goswami is a very competent person and for that reason he wanted him. Sanatan Goswami is very intelligent. (He thought) These people are now (behaving) are very good but again they may become very bad. For that reason he gave all the mohars to them and crossed the mountain and met Srikant, the husband of his sister. He wanted to take him to his own house. Then Srikant gave him a very costly rug, bhot kambal, taking that he came to Varanasi and sat outside (the house of Chadrashekhar Vaidya). Chaitanya Mahaprabhu said to Chandrashekar Vaidya, “One Vaishnav has come (outside). Bring him (inside).” He came out and he saw a fakir. After that he was asked by Mahaprbhu to become bhadra become a gentleman, to shave his mustache etc as he had got beard etc. Beard and mustache etc were removed and after taking snan (bath) he came there. But what vastra (cloths), would he wear? He went to Chandrashekar. Chandrashekar gave him one new cloth. “No, I shall not take it.” Then he went to Tapan Mishra. He also brought one new cloth. “No, I want one used cloth, used by you.” Sanatan Goswami as personal associate of Chaitanya Mahaprabhu is teaching us. I stay in this math and if anybody give me used cloth, I do not take it. 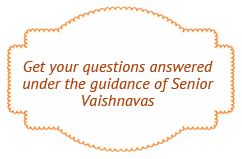 But here Sanatan Goswami has showed that you should take the remanants of vaishnavas. From the life of Sanatan Goswami we are to learn so many teachings. So many teachings. There is no end of it. And after taking that used cloth he wore it but Chaitanya Mahaprabhu is seeing the very costly bhot kambal, the rug. This is not defeating, “You have got this sort of cloth?” Next day Sanatan Goswmai gave it to a babaji near Ganges, “Take this and give me your cloth.” He has got very bad cloth. There were so many stitches in his garment. “You give me.” (After exchanging) Sanatan Goswami came to Chaitanya Mahaprabhu and Mahaprabhu was happy seeing that (the torn cloth). We belong to that group. He asked this question (who am I?) to Chaitanya Mahaprabhu to teach the conditioned souls of this whole world. He is emancipated soul. First question should be this. Ke ami? kena amaya jare tapatraya? Iha nah jani kemane hita haya. Who am I? First you have to understand this. “Why am I burning with the threefold affliction and what is the object to be attained and what is the way to attain? I cannot even put question to you. Please tell me everything. Then he started speaking, we have heard this, when we entered into this math 60 years before. But yet our Bhakti Siddhant Saraswati Goswami Thakur says, “You should repeatedly read, you have got no foundation. Only you say, you have got no belief. You should go through this, foundation should be there. Without that if you build the structure, it will fall down. (Now, what is the time? what can be done?) There are so many things, Sanatan Goswami has taught us. He had some scabies on his body while coming from Vrindavan, itches. For that reason when Chaitanya Mahaprabhu used to embrace him, he would say, “Do not embrace me, I have got scabies, patra”. But He (Mahaprabhu) repeatedly embraced him. Because of that he wanted to kill his body during Rathyatra. Then Chaitanya Mahaprabhu said to all the devotees what Sanatan Goswami was thinking, “His body is my body, he wanted to finish it. He has got no right to do this. His body is my body like this.” He embraced him and all his itches all sorts of scabies disappeared.